In this article, however, we will explore how you can use Chatkit with UITableViewController without the need for any third party library. Knowledge of Swift and Xcode interface builder. Cocoapods installed on your machine. Basic knowledge on Chatkit. Check out the docs here. If you have all the requirements, then let us start. Go to the Chatkit page. 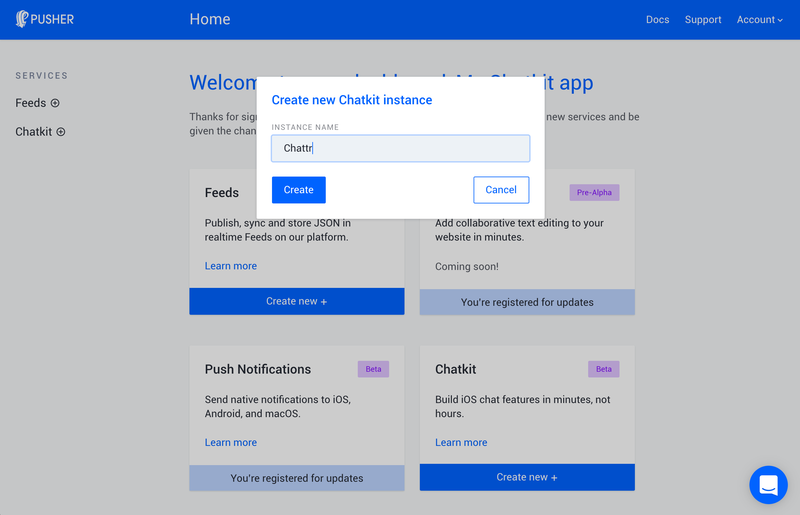 Create an account and create a Chatkit application from the dashboard. Follow the “Getting Started” wizard until the end so that it helps you create a new user account and a new chat room. On that same screen, after you have completed the “Getting Started” wizard, click on “Keys” to get your application’s ‘Instance Locator’ and ‘Key’. You will need these values to make requests to the Chatkit API. That’s all that is required to set up Chatkit. Now let’s create our application. 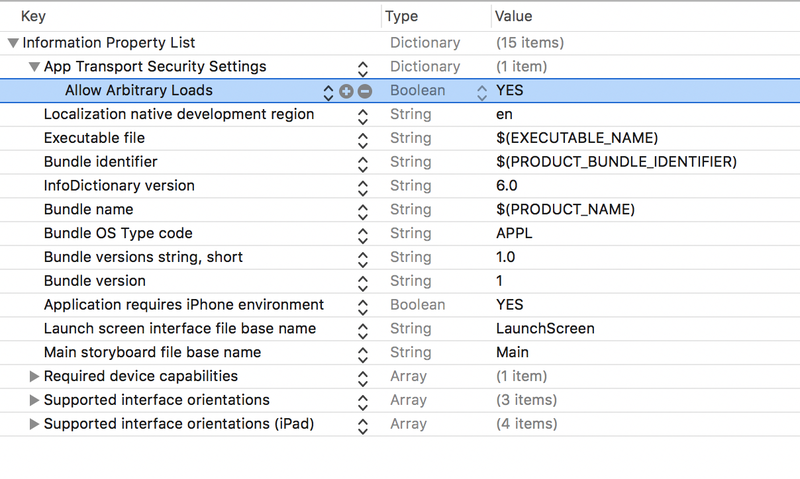 Launch Xcode and create a new “Single Page” project. Follow the wizard until you see the Xcode workspace. Now, close Xcode and launch your Terminal application. This will create a Podfile in the root of your application’s directory. The Podfile is where we will define dependencies we need Cocoapods to install and make available to our iOS application. This will add the PusherChatkit swift SDK to your application’s workspace. This will also add Alamofire which we will use to make requests to our Node.js backend. Once the installation is complete, open the *.xcworkspace file that was generated by Cocoapods. This will automatically launch Xcode. The next thing we want to do is create the views for our application. Open the Main.storyboard file. In the initial View Controller in the scene, add a button and a text field. For now, the button and the text view do not do anything. 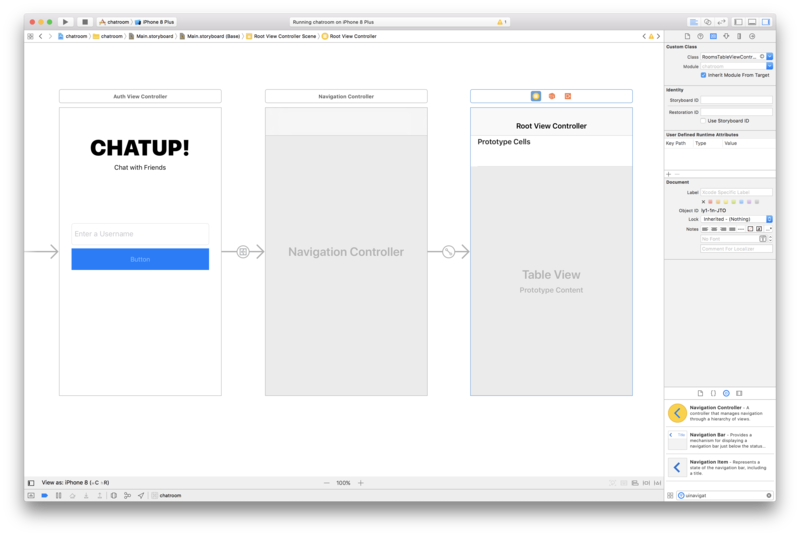 Create a new view controller file in Xcode called AuthViewController. This view controller is where we will do all the necessary authentication and provision our user with a token to make calls to the Chatkit API. After creating the view controller, open your Main.storyboard and make the controller the custom class for the view. Open the “Show Assistant” menu so that the Main.storyboard and AuthViewController windows line up side by side. Now create an @IBOutlet for both the text field and the button. These methods will serve as callbacks for the events fired when the text is edited and the button is pressed. Now any time the button is pressed the loginButtonWasPressed method will be called. Also, when the username field is altered, the textDidChange method will be called. In the above, we use the Alamofire library to send a POST request to AppConstants.ENDPOINT + "``/login``" (we will define it soon). When we get the response.data, we then pass it to the completion callback which will then be handled in the loginButtonWasPressed method. The ENDPOINT in this struct will be the remote backend web server. We will create this backend later using Node.js. The *PUSHER_CHATKIT_INSTANCE_LOCATOR* should be replaced with the instance locator provided for your Chatkit application in your Pusher Chatkit dashboard. In this method, we set the username property to the controller we will be navigating to before we get there. navigationItem.title = "Select a Room"
Open the Main.storyboard and add a new navigation controller to the board. The next thing you need to do is create a manual segue from the *RoomsTableViewController* controller to the navigation controller. Call this segue *loadRoomsTableViewController*. Next, give the table cells a reuse identifier of RoomCell. Note that I have set my “Table View Cell” type to subtitle. Open your RoomsViewController. Let’s make our application connect to Chatkit. The rooms will hold multiple PCRoom objects, the selectedRoom will hold a PCRoom object for the selected room, and the currentUser will be a PCCurrentUser object. 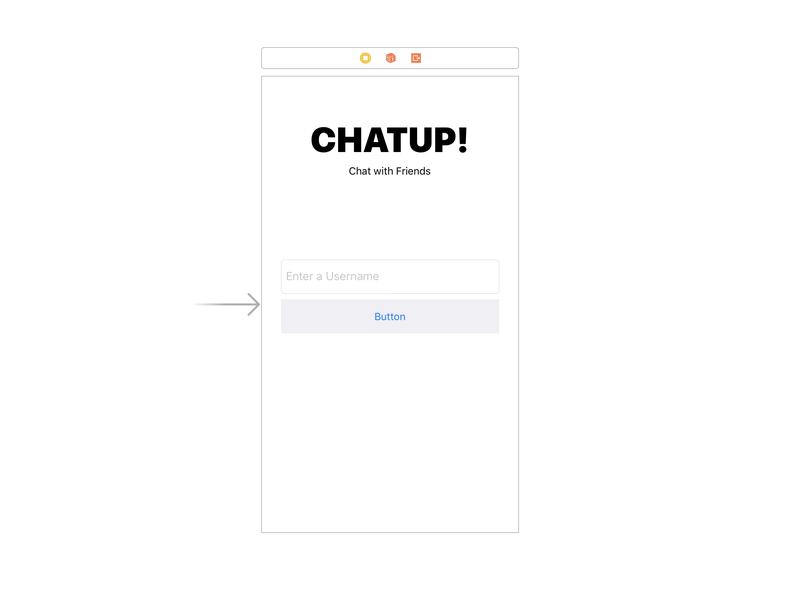 This method will instantiate Chatkit and connect to the service. We use a token that will be returned from our remote endpoint to make requests. When a successful connection has been established, a completion handler is called. At this point, we can make authenticated calls to Chatkit. Now let us display the actual data in our UITableViewController. Add the following methods below to make our response the data source for the table view controller. cell.detailTextLabel?.text = rooms[indexPath.row].isPrivate ? "Private" : "Public"
In the first method, we return the count of rooms available to be joined. In the second method, we make sure each cell is configured to show the name and visibility of the room. The first method sets the selectedRoom object and then calls the performSegue method. The second method prepares our destination controller before we get there. Our preparation includes setting the selectedRoom object on the controller and setting the currentUser. Now let us create the room view. This will be where we will see all the messages that are specific to a room. Go to your Main.storyboard and add a new UITableViewController scene. Make the new class you just created the custom class for the scene. Click on the new view controller on the storyboard and go to the “Connections Inspector” in the right sidebar. Drag from the “show” panel to the RoomsTableViewController to create a manual segue between them. Set the identifier of the segue to loadRoomTableViewController. The next thing we want to do is create a custom table view cell class. This will be where we will customise the look of our table view cells for messages. This class basically sets the design and constraints for the table view cell. If you look into the methods, it just sets height, width and so on. Nothing too special. Now we need to set this class as the custom class for our table view cell in the RoomTableViewController. 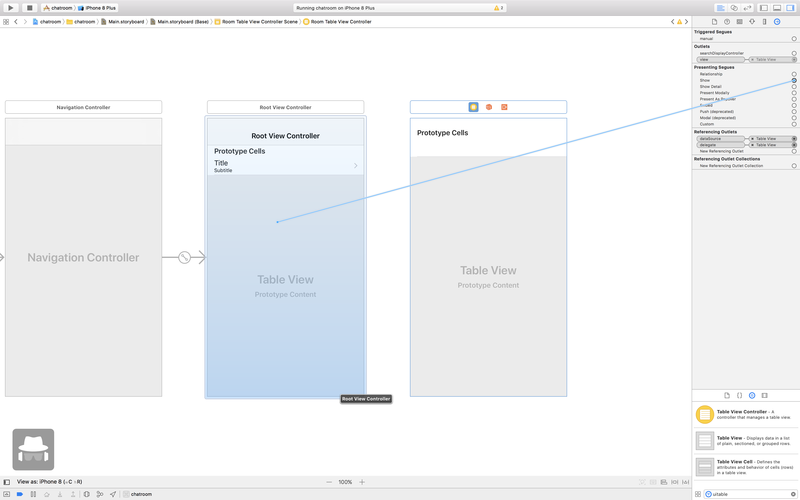 Open the storyboard and click on the prototype cell on the latest table view controller. Set the MessageTableViewCell as the custom class for the prototype cell. Next, set the reuse identifier for the cell to MessageCell. Display messages available in the channel. Add ability for a user to add a new message. This method is a product of the PCRoomDelegate. It is automatically called every time a message is added to the current room. In the method, we add every message, as it comes in, to the self.messages array. We then reload the table data to see the changes. ⚠️ As the docs say, when making UI updates you need to do it in the main thread. That is why we are dispatching it to the main thread. In the methods above, we are making sure the table cell picks up the correct data from the self.messages property. In the *tableView(_ tableView: UITableView, heightForRowAt indexPath: IndexPath)* method, we calculate the height of the table cell so that long text is wrapped and handled properly. In the method above, we create an alert controller that displays a text field. You can use this form to send your messages and it will be added as seen in the “Add” UIAlertAction's callback handler. With that, whenever you add new messages, they will be sent to Chatkit. That’s all for the iOS application. We will, however, create a demo Node.js application. We will need this to test the app. Let’s do that. In the Express application above, we create the /login and /authenticate routes. The login route is responsible for creating a new user tied to our Chatkit application, while authenticate is responsible for getting a token for the user to make requests. ⚠️ Remember to replace PUSHER_CHATKIT_INSTANCE_LOCATOR and PUSHER_CHATKIT_KEY with the actual values for your Chatkit application. You can find the values in the “Keys” section of the Chatkit dashboard. In this article, we have been able to harness the power of the Pusher Chatkit SDK to build a messaging system with just the built-in UITableViewController. Hope you picked up a few things. I cannot wait to see what you build using Chatkit.